And along those lines, an oldie but a goodie: Voicemail message [audio], with increasingly frustrated obscenities, purportedly left by trademark applicant/appellant with the Trademark Trial and Appeal Board (TTAB); resulting Final Order concerning disciplinary action of the attorney (linked here). 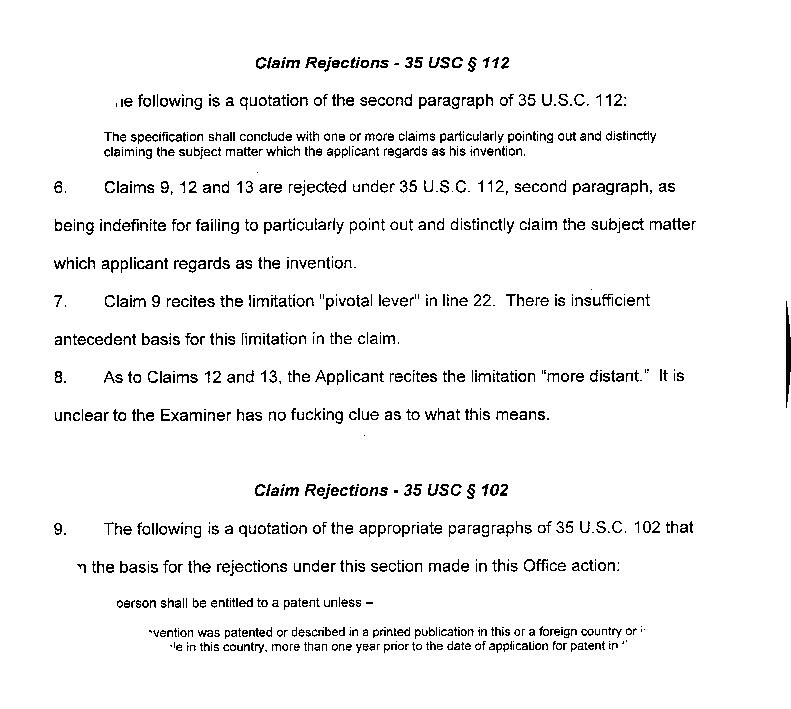 Update: Here is an official Response from an Examiner at the patent office employing obscenity. Re my previous post–this article appeared today in New York Lawyer, listing my blog as a source of the voicemail left by Winston & Strawn associate Ankur Gupta [voicemail here]. I despise incompetence so actually tend to side with Gupta. An expletive-laden voice-mail message, reproduced on blog KinsellaLaw.com, left by an associate at one law firm for a colleague at another is making the rounds in cyberspace, with young lawyers seizing on the message as a symbol of declining civility within the profession. In the message, Winston & Strawn associate Ankur Gupta in Chicago berates an associate in the New York office of Latham & Watkins for apparently complaining about changes Mr. Gupta and his colleagues requested on a mortgage document. Mr. Gupta tells his fellow lawyer that he should save his “[f**king] breath” and that if he continues to complain about the changes, Mr. Gupta will make his “life on this deal very unpleasant” by involving his client. The Winston & Strawn associate concludes by advising the Latham associate that if he will not act as a “monkey [f**king] scribe,” his work will be given to a secretary at Winston & Strawn. Forwarded to lawyers across the nation, the message has unleashed a firestorm of Internet message board commentary. In my view, all this noise about “the decline in civility” is part and parcel of lawyers’ attempt to keep their profession licensed so as to keep out competition. It is arrogance to believe civility is more the domain of attorneys than “normal” people. Re my previous post, Chicago Sun-Times reporter Eric Herman has picked this up story and is running with it, in F-bomb-dropping attorney gets worldwide notoriety [alternative link]. Coda: others have picked it up too, including this one from The Chicagoist, Lawyers Drop F-Bombs?, which includes some decent gossip about the “victim” and interestingly, some off the cuff defenses of the angry attorney. Another discussion forum is on MyShingle. Re recent posts about humorous lawyer voicemails, I was reminded of this story: Elite Firm Summer Associate Sends E-Mail Boasting Of Laziness to Partners. Following up on recent posts about humorous voicemails and emails, here’s another humorous voicemail. The story behind the voicemail is explained here, and in the letter below. recent humorous voicemail and couldn’t resist writing you to share something amusing that happened to our company. obviously did not invent but nevertheless submitted a trademark request for to the USPTO. trademark for the symbol in printed matter class of goods. As a joke, we wrote a fake press release about how–in light of our trademark on the symbol–we planned to sue several million individuals who had used the symbol in email of late. because of some clumsy reporting and overzealous netizens, it ended up becoming a gigantic outrage to many thousands of people who missed the joke. The most amusing contact we received came in the form of a late-night voicemail from someone who sounded very drunk. http://www.despair.com/frownies.html The voicemail is linked in the page above. It is expletive-laden and frequently incoherent–but provoked gales of laughter and ultimately, the desire to share the joke with others. confusing listen, though admittedly, for a somewhat select audience. I hate cold callers and people who waste my time. My employer’s web site does not list my phone number. That’s on purpose. People whom I have not given my direct dial number have to call the main number and ask the receptionist for me. So when the receptionist wants to patch a call through, I know it’s almost always a cold caller. Today she says a guy named “Mo” is calling for me. Red flag#1. I know no Mo, so red flag #2. Usually I tell her to put them to my voicemail, but the name “Mo” intrigued me and I was feeling in a mood to mess with a cold coller. I tell her to patch him through. Mo–he does not give his last name, red flag #3–is some broker for some “patent technology acquisition” group (I forget the name). He wants to know if we have an interest in buying a patent on photonic integrated circuits. Now we make lasers, not PICs. Another red flag. Curious, I ask him how much they are selling the patent for. He says it has 61 claims and that there is an offer on it already–setting me up for a high number–then says probably only $120K or so, which is not really that high. I say, well, what’s the patent number? He says he does not have it and I can hear him flipping papers looking for it. He asks me if that’s public information. I.e., if he can find the number is it okay to give it to me. This loser is asking me for legal advice. So I’m already getting irritated. Why would you call someone to offer to sell a patent but not know the patent number. So it’s clear to me that Arab-accented Mo (probably Mohammed) is just trying to put a deal together. Some stupid broker. Probably unknown to the seller as well as me. My time already wasted, I decide to mess with him. I ask him why he thinks this would be useful for us. He says he knows we bought an external-cavity laser patent recently, from a press release, so thought we might want this. This makes no sense. I ask, is there an existing infringer? Do we infringe? Does it cover some practical invention? “Does what?” I ask. “Makes lasers,” he replies. “Well, the laser goes in it,” he tries to clarify. Well, at least I didn’t call him to waste his time.